Here is about the only shard I have ever dug that I cannot identify. This piece came from a late 60s to early 70s pit and is either a square or case gin style. I found several panels but the top, or any more embossed shards were not found. There appears to be a tree of some type ( palm? ), and the letters "BRINK" and a letter "E" reading a different direction... It is olive green and full of bubbles. your shard is a case gin, The Olive Tree - John Linnenbrink. 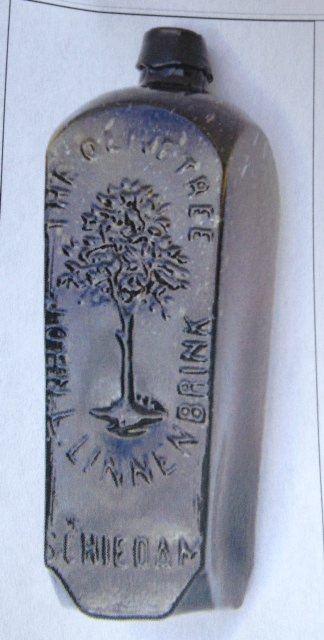 That would be: "THE OLIVE TREE / JOHN L.LINNENBRINK" case gin. Their not common by any means. Is it American or continental? Age? I believe these are American made and come in two sizes. As far as age goes I think your right on. I have seen pieces of these here in the gold country but never knew what they were.